For my purposes, I’ve mostly used midi keyboard controllers to control Reason. I’ve been using Propellerheads Reason for many years, since version 1 actually, and over that time have used many different controllers with it’s various versions. Some controllers were hard to use, others easy. Some controllers were keyboards, some were drum pads, some a combination of both. Some controllers broke after a short period of time. Others have lasted me long enough that I still use them. Either way, I eventually ended up using an Alesis QX25 midi controller with my current “mobile” setup for electronic music. By that, I mean the setup that can pack into a backpack and take to a friends house to jam, or take up on stage easily with little effort or fuss. Why did I initially buy it? For it’s small size it still has two octaves of full-size keys (I have big hands), 8 rotary knobs and 4 drum pads – and on top of that both pitch and mod wheels, and some other useful buttons and controls. In my opinion. 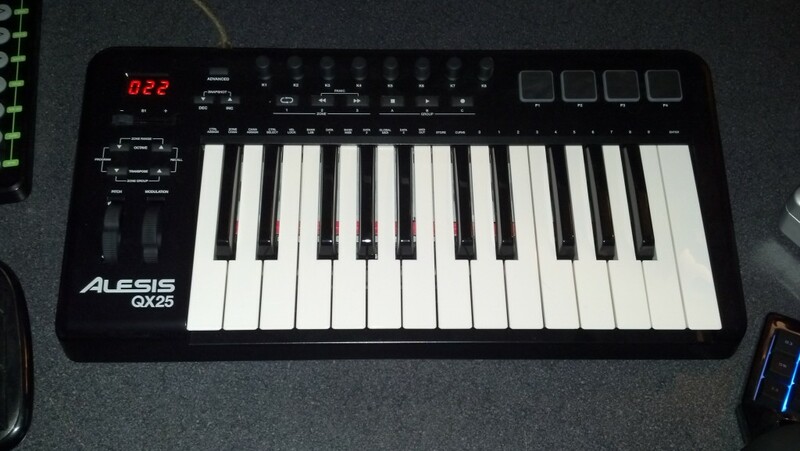 this little keyboard has a more versatile lineup of controls than any other compact keyboard I’ve used. It’s nothing overwhelming, but just enough to make me never feel like I’m missing something. The keys feel good – and they are light, not weighted like normal piano keys. But I didn’t expect heavy keys from a small, cheap keyboard either. They play nice though, and I can play comfortably. The full size keys are nice too, I don’t like mini keys in most cases. The knobs feel good on this machine, they turn smoothly and don’t feel like they are going to fall off. They’ve stood up to what I’ve put them through. They do have a click – others online have mentioned this as well. I thought it would be more noticeable based on reviews I had read read, but it doesn’t really affect me in any way in how I used the knobs. I have no complaints here. The pads are what I would consider to be solid, ok, but not great, or bad. In the middle. They are not responsive like pads on an MPC. They have a lot more “give”. You have to really pound em to get the dynamics you might expect from higher end pads on higher end drum machines. But at the same time, they don’t seem bad really. The pads are all consistent with each other, and feel good, and are responsive enough to pound out beats with your hands if you are in to that sort of thing. It’s a nice feeling to be able to be playing a bass line on the keyboard and then play a beat at the same time with the pads (with Reason). I trust the pads enough for beats on the fly. I don’t use these wheels much, but when I do, they are solid and react exactly like I would want them to. The pitch wheel has a nice spring to it and snaps nicely. The mod wheel is smooth and has a little bit of weight to its feel, which I like. The mod wheel on mine makes sort of a slight, light scratching sound at the furthest of one of its directions, but it’s not really enough to bother me. I haven’t heard of anybody else having this problem, it might be just a minor imperfection on my particular unit. I’m sure if I took the case apart I could figure out what was causing the friction, and maybe fix it. But at this point I don’t really care enough and it doesn’t really bother me at all. There are also octave controls to help you go up and down the octaves with the smaller keyboard. This is pretty handy. And there are some other control buttons that can be used to control play/stop/record controls or other things. And on top of that there is also a fader that can be assigned as needed to do fine tuning of controls. As you can see, there are a lot of options here, and pretty much any control you would expect from a unit like this is here. The Alesis website also has the specs and other info if you are interested in that sort of thing. 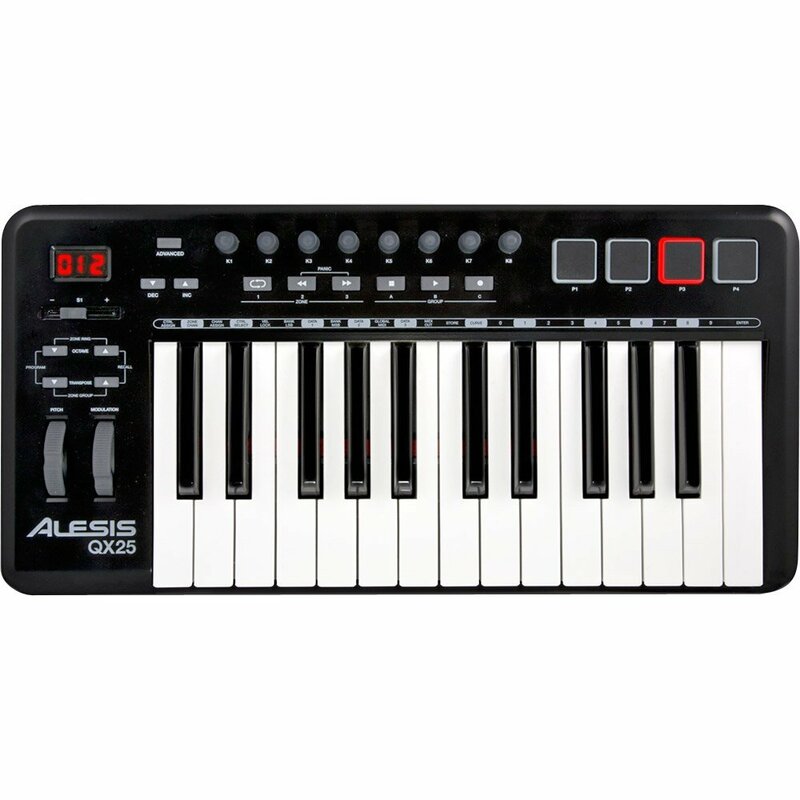 I use the QX25 keyboard with Reason 4, running on an Asus laptop. It’s a decent setup, very cost-effective overall. 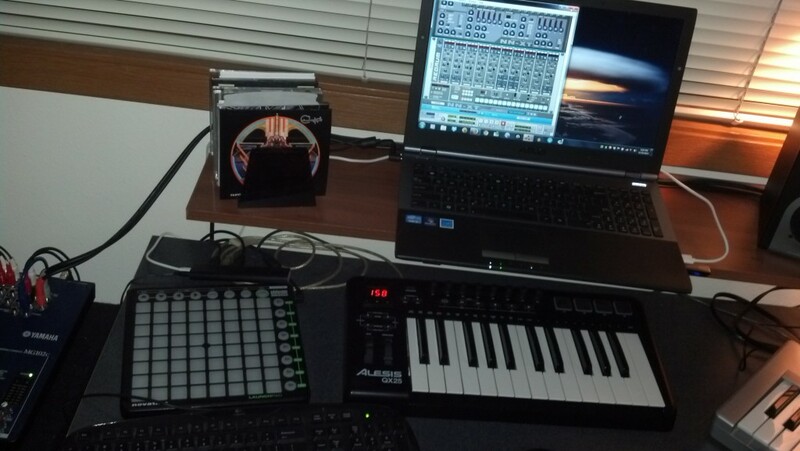 I also have a Launch pad plugged in that I use with Ableton on the same laptop. Everything plays nice together, including the QX25. Reason 4 doesn’t have the QX25 in the list of equipment when assigning the device in the settings, so that caused me a little bit of initial confusion. But this device came about well after Reason 4, so it is hard to be surprised about this. Either way, I ended up selecting the “Alesis Photon X25” device from what was available, and it works. I don’t get any presets really with any devices that way, but it works for me since I like to customize all my controls. I just use Reasons auto-detection to rapidly assign the controls to the knobs/buttons that I want on various devices and then start jamming. It’s very easy to assign and setup, so I don’t spend a lot of time configuring, and more time jamming on stuff. I also have Reason 7 installed on my desktop audio computer, and there still is no option for any other Alesis keyboard besides the Photon X25. So it looks like this keyboard would probably work about the same with all the latest versions of Reason, until they eventually add it to the list on updates. Overall, I find this keyboard easy to use with reason, although there appears to be no auto setup templates in my experience, which some might find inconvenient. It is plastic. That is for sure. But it is pretty sturdy plastic. It doesn’t feel like it will blow up when using it and playing it with energy. At least it hasn’t done that to me yet. I’ve pounded out a lot of beats on the pads and they are holding up well so far. The knobs all still feel like new. I haven’t really had any problems with the quality yet. I will have to consider what this thing is like after a couple years of use though. Usually about the 2 year mark for me is where plastic reliance electronic like this start to come apart at the seams. I haven’t owned this for long enough to make that judgement yet. Let’s just say it feels like it will last, and it has so far, it just hasn’t had the appropriate time-testing yet. I like this little keyboard. 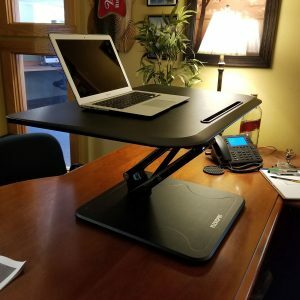 It works well and has held up to my use so far. It has good options for controls. It fits in a backpack. 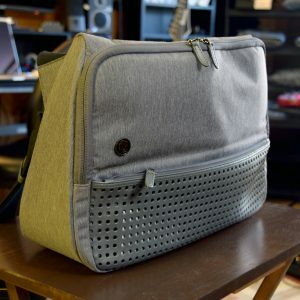 Its a good companion to a laptop. 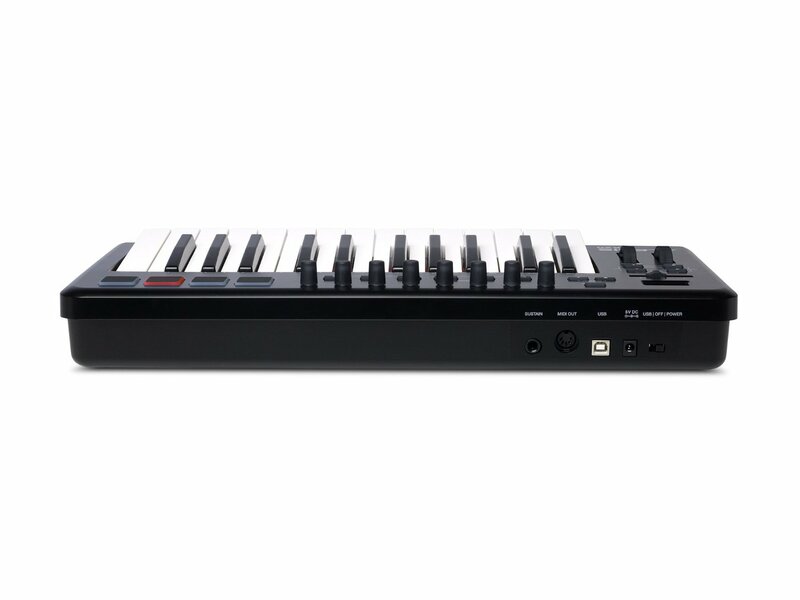 I would recommend this for anybody that needs a versatile midi controller on a budget, and for those on the move. 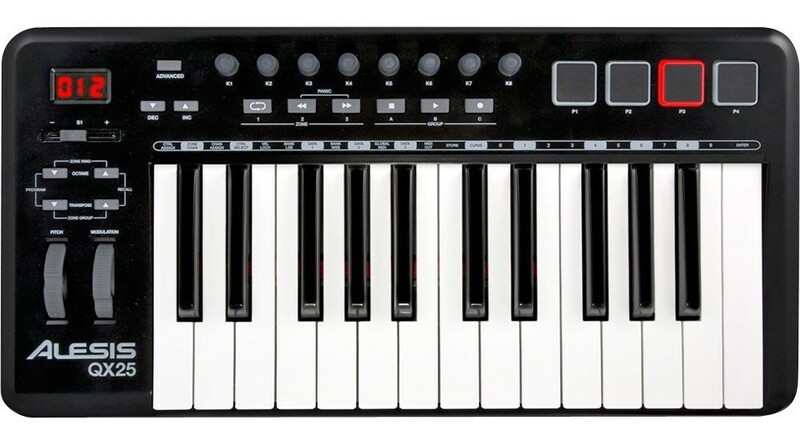 If you need more octaves than two, or need more drum pads than four, or more than eight knobs, you will feel cramped on this little keyboard. But if you appreciate its limitations it can be very useful. You can buy this one at Amazon, it’s under $100 there usually. This is a steal in my opinion from anywhere for under $100 if you can find it for that much. 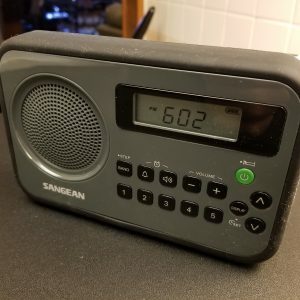 not sure if you still have this, but are the knobs endless? that is, when you switch from synth to synth, you can move them and it will resume from where it is instead of being a fixed value from 0 to max? Hey man – good question. Yep the knobs are endless, I just checked, and they do resume from where the setting is at rather than going from a fixed value.